In the Golden Triangle, people joke that growing up in East Texas is about the same as growing up in Western Louisiana. Certainly there is no shortage of crawfish, Catholics or cajuns. And, given that Mardi Gras season comes to an end tomorrow with Fat Tuesday, it only seems appropriate that I share a vegetarian adaptation of a very traditional Creole dish. Jambalaya is Louisiana’s version of paella. Traditionally it is made of three parts (meats, vegetables and rice) cooked in stock. Most often chicken and andouille sausage are used for the meat, though, since childhood, I’ve always preferred Jambalaya made with shrimp to its meatier counterparts. In parts of central Louisiana it’s not uncommon to find the dish made with crawfish, oyster, turtle or alligator. Cajun and Creole recipes vary from each other in terms of included vegetables. Cajun Jambalaya, the kind most often found in my hometown of Beaumont, uses onion, celery and green bell pepper. The smoky flavor and brown coloration are a result of sausage cooked in a cast iron pan. However, the more traditional Creole version, which uses onions, peppers and tomatoes is the one I prefer and, for reasons you can deduce, is more easily adapted to a vegetarian entree. Enjoy and, as they say in the Crescent City, laissez les bon temps rouler! This vegan adaptation of Jambalaya takes about 45 minutes, start to finish, including 25 minutes of cooking time. If you prefer a pescatarian version, substitute one pound of peeled, deveined shrimp for the zucchini and summer squash. Instead of cooking the shrimp at the beginning of the process, add raw after rice has been in the mix for 20 minutes. Cook shrimp in broth, rice and vegetable mixture for approximately 5 minutes or until pink and cooked through. Heat large Dutch oven over medium heat. Meanwhile dice zucchini and summer squash into half -inch pieces. When dutch oven is warm, approximately 4 – 5 minutes, add one tablespoon of olive oil to pan. Tilt to coat bottom of dutch oven before adding zucchini and squash. Season with salt and pepper to taste and saute until just beginning to brown and soften, approximately 5 minutes. Meanwhile dice onion, red and green bell peppers. If making no-chicken broth from bouillon, start water to boil in kettle. Remove zucchini and squash from pan and set aside. Return Dutch oven to heat; when warm, add an additional tablespoon of olive oil to pan. Tilt to coat pan with oil before adding onion and peppers. Saute, stirring occasionally, until begining to soften, approximately 7 – 10 minutes. Add garlic, 1/2 tsp salt, large pinch pepper, paprika, oregano, thyme, bay leaf, cayenne pepper, tomato paste, broth and canned tomatoes. Increase heat and bring mixture to boil. 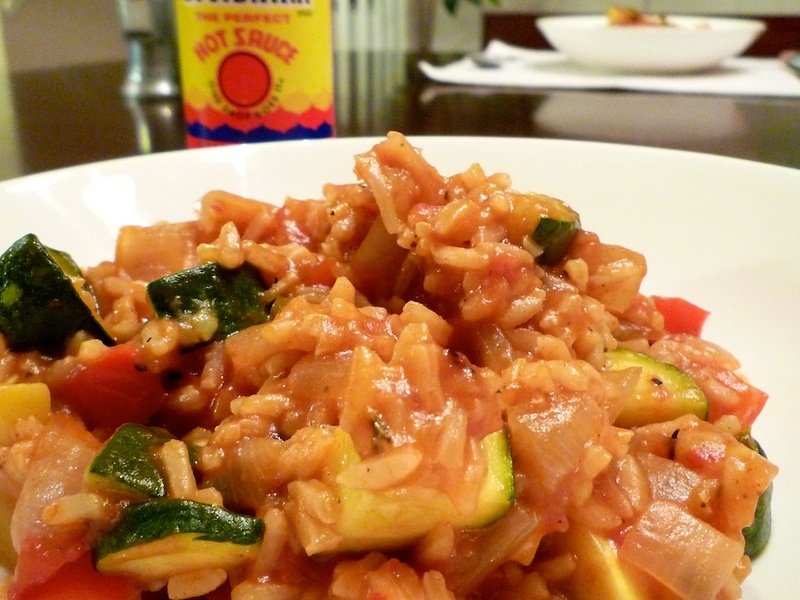 After rice is cooked and most, but not all of the liquid is absorbed, add reserved squash and zucchini. Stir to incorporate. Remove bay leave, cover and cook over low heat for an additional 5 minutes. Taste and season with salt and pepper ; serve immediately. Dish can be kept in air tight container in refrigerator for up to three days or in freezer for up to six months. Makes 4 entree sized servings, approximately 2 cups each. I know you’ve twittered a bit with another member of our team, but I just wanted to get in more direct communication with you so we could better coordinate outreach efforts. T-bones and tofu’s focus of incorporating a variety of cuisines for a healthful and balanced diet really falls in line with Meatless Monday’s mission to help people reduce meat consumption moderately to improve personal health and conserve environmental resources. Many bloggers think its fun to do weekly Meatless Monday posts, usually profiling a meatless recipe or another benefit to going meatless every Monday. Is that something you think you’d be interested in? If so please email me at jlee@mondaycampaigns.org. That looks so good! I am definitely going to make that soon. I will let you know how it turns out. on a side note, I love the stories and information behind each recipe. It makes for a good read. Wow…this was great. Thanks for the recipe. I preferred to use brown rice (actually, I used instant) and just added it towards the end of the cooking time. Thanks Shari. Just last night I was thinking about this recipe to bring to a creole pot luck. I’ll have to give the brown rice a try.